Nestled on an island in Cork Harbour, Hop Island Equestrian Centre offers you tranquility in a rural setting, while just a short drive from the City. Here at Hop Island, we cater for all levels of horsemanship, and offer the riding enthusiast direction in Dressage, Showjumping, Cross Country, Riding and Hunting (with local hunts in season). We provide qualified instruction for all ages, from beginners to advanced riders, with quality horses and ponies for all levels of riding. 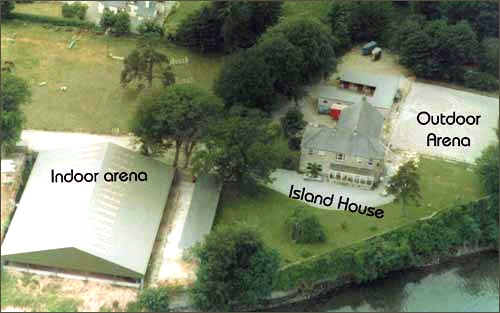 Hop Island Equestrian Centre consists of a large Indoor Arena, an Outdoor Arena, school horse stables, livery stables, pony stalls, a tack room, a feed room, a schooling cross country course which includes jumps, banks and ditches, access to our very own private pebbled coastline and Hop Island House. Other amenities nearby include restaurants, bars, hotels, cinemas, golf courses, sailing, country walks, and for those who enjoy to shop, a large number of craft shops and boutiques are housed in various shopping malls, all only five minutes drive away.